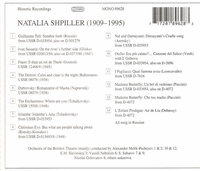 "Natalia Shpiller sang at the Bolshoi between 1935 and 1958. She and Kruglikova were competitors in a series of roles. While Kruglikova had the more fragile and fresh-sounding voice, Shpiller had the more robust voice with greater dramatic reserves, also capable of an intensely lyrical performance. It was rare for Shpiller to make a guest appearance beyond the Iron Curtain and possible only with Stalin's immediate support, such as in 1945 when she sang the title role of Puccini's MADAMA BUTTERFLY in Vienna."